We have just purchased a new home and move in next week. The cabling situation has me confused, lol. Cat5e cabling runs throughout the house. All this utterly confuses me. I have a Linksys WAG160N ADSL+2 & Gateway router. I am wired to my main desktop PC and any other laptops run wirelessly. 1. How do I hook up a phone to these RJ45 ports? If I need phone and internet from one port would I need a splitter/adapter of some sort? 2. Where will my router need to go now? in the wardrobe? 3. Why all the coaxial ports? We only have 2 devices that need them that I know of, 2 x MySkyHDI boxes. Anyone here able to help me understand this new-home setup? laymans terms please, hehe. Honestly - Ring a professional, that is a mess; completely unfinished. All someone has done is connect all the network cables to the phone line. None of the Coax are connected. Is this a brand new house? Who installed the gear? I hope you didn't pay money for an absolutely terrible wiring job like that. It really is proof of why some people shouldn't be allowed to touch data or phone cabling. Do all of those cat5e cables run to RJ45 jackpoints? That system has actually been wired up incorrectly. All cat5e cables should be terminated on the krone terminals on the block on the right. Your incoming phoneline should be connected to the bottom "from telco" terminals. These units should have come with some krone to RJ45 jumpers that fit onto the blue/blue white pair on the phone (left) krone board and then plug into the RJ45 port on the right (data) one. If you find who installed this you should name and shame them on here. They seriously shouldn't be installing equipment and charging for it when they have no idea what they're doing. sbiddle: I hope you didn't pay money for an absolutely terrible wiring job like that. It really is proof of why some people shouldn't be allowed to touch data or phone cabling. I'm sure it's all standards based! It is - problem is many electricians buy these Signet systems and think they're experts at installing them. The house is in a new subdivision. No doubt there is more work to be done on it in the 9 days left before we move in, hehe. I think yes the RJ45 cables run to each port in the house. Snap are going out next Friday to hook up internet and phoneline. Is anyone able to reply to my questions as it appears? You should be able to plug a phone into any jack in the house with an RJ11 RJ11 jack cable. It looks like a small RJ45 jack. Yes the router will ideally go in the cupboard but a filter needs to be installed. Basically all its good for at the moment is for phone, it will need a professional (or a geek) to make internet and TV work (nothing major, less than 1/2 hour of work). Snap should send out a chorus tech who should install a master filter for you and maybe tidy things up in the panel if you ask him nicely. Any TV aerial or sky installer should be able to finish up the TV side of things for you. But as everyone else has said, chase up the original installer and get them to sort it out. Ahhhhhhhhh, many thanks!!! I had no idea the RJ11 went into a RJ45 slot, lol. Just tested it and of course you are right! duhhh. I think I should probably shuddup and just keep an eye on it over the next week or so as we will be going there every couple/few days. The Chorus tech is I think booked for next Friday which is great. I guess we will leave things up to him then! The sky installer is also coming on the Friday or Saturday. Just wondering why so many coaxial ports all over the place? RJ11 plugs should NEVER be used in RJ45 jackpoints. While RJ plugs are a modular design and they will fit you will cause damage to the RJ45 pins. Just buy an RJ11<->RJ45 cable from an electrical wholesaler or use RJ45 master adapter if you have BT cables and don't mind an ugly adapter. ShellNZ: Ahhhhhhhhh, many thanks!!! I had no idea the RJ11 went into a RJ45 slot, lol. Just tested it and of course you are right! duhhh. There aren't a lot. The new TCF guidelines recommend 2 coax connections to every TV jackpoint and 4 to the prinmary TV viewing area. ShellNZ: We have just purchased a new home and move in next week. Its not standards compliant even if it essentially runs along the structured cabling lines, and the person who decided that a bedroom wardrobe is suitable for telecomms distribution needs to be shot as well. All wiring and connectors must be minimum Cat5e and tested. With Cat5e cables on commoned 110 blocks they would not have even been tested for wiremap and certainly wont support any ethernet. Terminations should be as close to the terminal as possible and MUST maintain the wire twist. Those terminations should also have had the excess trimmed off. Cables should be labeled within 200mm of the termination. Those cables have no markings at all, would need to be tested one by one to find which room each connects. The earthing screw is probably obscured, but should have its own earth wire on the metal part of the cabinet. There should also be a power supply in or near the cabinet. The distributor cabinet should be placed close to the incoming Phone line, which is unlikely to be upstairs in a new subdivision. A fault on internal wiring could easily result in an expensive "No Fault Found" if a Telecom contractor comes to fix it. Looks like the alarm guy assumed all cabling would go in the garage, as it probably should have. Somebody probably tried to save a few metres of cable. There must be instructions telling the user how to connect patch cables to services, and how to isolate faults by using the disconnect test point. Minimum 2 RJ45 ports at every telecom outlet (allowing you to connect both phone and ethernet simply). Looks like you will need to plug in a splitter at each end or sue the sparkie to install extra cabling and fix everything else. My place is wired exactly like yours (my landlord doesnt know I bypassed a few wires to at least get one ethernet link), and certainly had never been tested because a pair had never been attached to one jackpoint. Phone will probably work as is, but you might need RJ45 phone cables. Get them on internet instead of a shop, eg trademe... Router is supposed to plug in at the wardrobe cabinet, but they didnt connect the RJ45 ports there or install any splitter. Ask the errant sparkie or your own cabling guy to set up for ADSL. The coax probably isn't connected because the sparkie gave up and hoped the SKY people would finish the job. Oh, the TCF standard also hints that ordinary users should not be required to use punchdown blocks like that unless they are likely to be techs with the right tools. Patch panel is also easier to label, and do make sure they label it. And take some before and after shots as proof to the disputes tribunal if you need to claim back the cost of fixing it. I dont agree with everything in that standard either (especially the tacked on bit at the end requiring expensive Gigabit certification printouts) so lucky its not compulsory. Took a while to read through it though. webwat: Oh, the TCF standard also hints that ordinary users should not be required to use punchdown blocks like that unless they are likely to be techs with the right tools. Patch panel is also easier to label, and do make sure they label it. And take some before and after shots as proof to the disputes tribunal if you need to claim back the cost of fixing it. The Signet units don't require end users to use punchdown blocks. 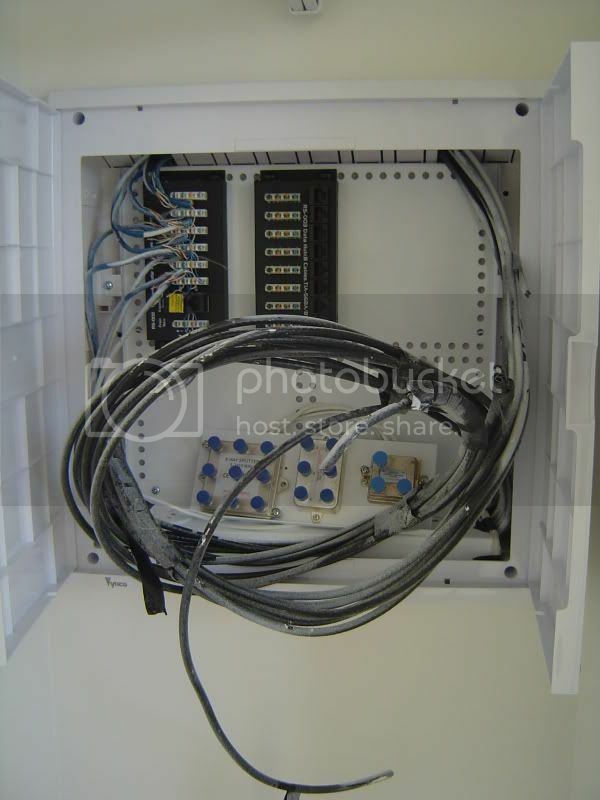 There are still many installers who run individual cable runs for both BT and RJ45 jacks back to the data and phone krone blocks. In an ideal world these should all be run back to the data block and the krone->RJ45 patch leads used to move phones between the different ports as required. The biggest limitation in this case is the single RJ45 panel. At the end of the day the Signet units are a waste of money and are poorly specced, but because there is a vast lack of knowledge in the electrical industry many electricians continue to provide and install hardware to very poor standards. You have been a huge help. I will be seeing Fletcher homes lady at 10am this morning so will ask her about unfinished cabling. Not sure she will know much but she should at least check with someone. Will keep an eye on it over the next week as stated, we will be going there every 2/3 days. If no progress I will jump on their sparky-arses. Can you please elaborate? What is a better alternative?